Florida state Sen. Dana Young and state Rep. Kathleen Peters recently filed companion bills (HB 237 and SB 462) intended to ban hydraulic fracturing, commonly known as “fracking,” in the Sunshine State. Not only would these ill-advised bills needlessly ban a routine practice used safely across the country for many decades, but they would also be detrimental to the state’s existing conventional oil and gas industry. The announcement of the bills was preceded by a call organized by the Floridians Against Fracking (FAF) coalition, which featured anti-fracking activist and actor Mark Ruffalo, most widely recognized for his role as the Incredible Hulk. As the Tallahassee Democrat reported ahead of the call, “Hulk smash fracking in Florida. Or at least Mark Ruffalo, the actor who plays him in the movies, wants to.” Never mind that fracking doesn’t actually occur in Florida. Then again, this “Keep It In the Ground” campaign is about a lot more than just banning fracking. Ruffalo was an active participant in the fight to ban fracking in New York, and regularly uses his celebrity as a “megaphone” to spread misinformation and debunked research compiled by activist academics like Cornell University professor Tony Ingraffea, who has also been invited to speak to Floridians about a practice he has admitted having no expertise on. Ruffalo made clear during the call that the goal of his movement is not to ban fracking; it is instead a concerted effort to stop all fossil fuel development, whether it be the “conventional” industry that has thrived in Florida for decades or the “unconventional” industry most active in America’s shale plays in other states. Mary Gutierrez, Executive Director of Florida’s Earth Ethics, an FAF member, responded to Ruffalo’s latter remarks — which specifically addressed a question she asked on what a Florida ban would mean for the rest of the country — by saying, “I agree. I agree. Thank you so much,” confirming FAF’s ultimate goal is to ban all fossil fuel development. “Their bills would prohibit all forms of ‘advanced well stimulation treatments,’ meaning no high-pressure injections aimed at cracking the bedrock in search of black gold. Acid fracking – similar to hydraulic fracturing, with chemicals subbed in for water pressure to break through the rocks – is also expressly banned in the bills. 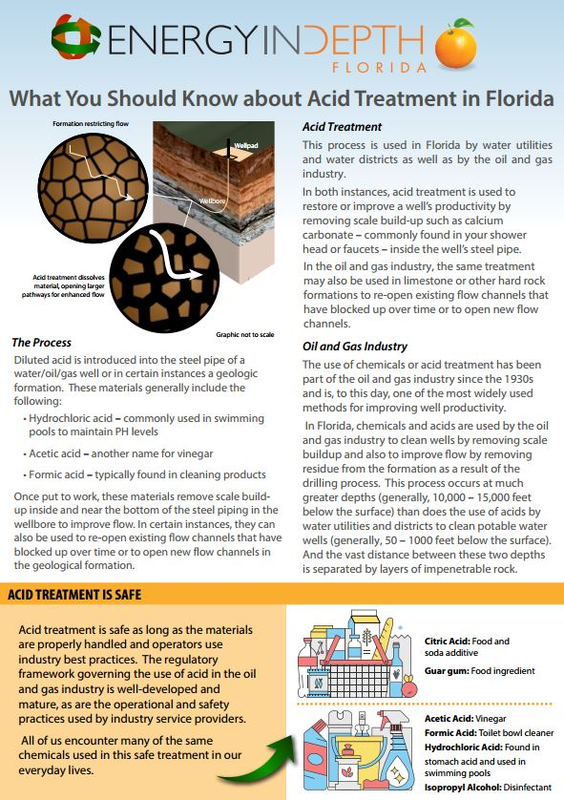 In other words, the conventional oil and gas industry has a long history of safely using acid for routine maintenance and to improve the performance of the state’s producing wells. The “Sunshine State” may indeed be exploring implementation of more renewable resources into its energy mix, but a large-scale renewable transition is not something that will occur overnight. After all, Florida is one of the five largest energy consuming states in the country. And considering Florida was the fifth largest consumer of natural gas in 2015, the proposed well stimulation ban will ensure that even more of Florida’s energy comes from other states where fracking is already used safely by hindering a conventional oil and gas industry that has a proven record of success and significant positive economic impact in the state.